‘Tis the Season to be Spooky! This October 31st, Halloween doesn’t need to be scarily expensive. 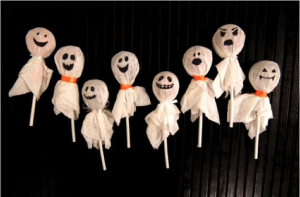 Here are just a few easy DIY ideas you can bring to any party that are sure to provide some frightening fun for friends and family. 1) Cut the apple into slices. 2) Put a spoon or two of peanut butter onto each slice of apple. 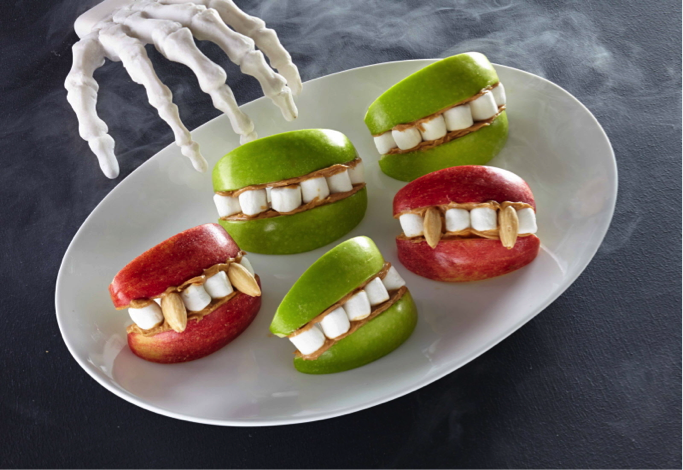 Then, put a row of mini marshmallows across another apple slice. 3) Firmly press the two together until they stick and you have your teeth! ** For vampire fangs, substitute two of the marshmallows with almonds! 1) Tear a paper towel sheet (usually this is enough to cover one lollipop). 2) Cut a strand of each orange and black ribbon. 3) Wrap fabric around lollipop and tie with ribbon. 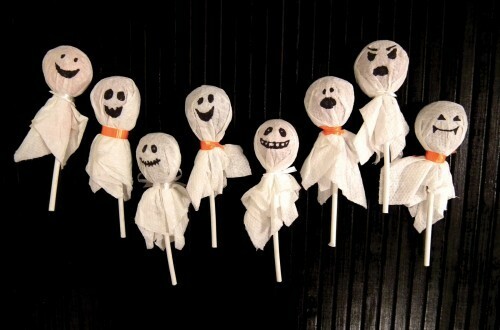 4) Draw silly, scary faces on the paper towel! 1) Mix together 1/4 cup light corn syrup with green food dye. Set aside. 2) Place glasses in the freezer to frost them. When frozen, dip each glass into the green syrup and allow the syrup to drip slightly. Return glasses to the freezer. 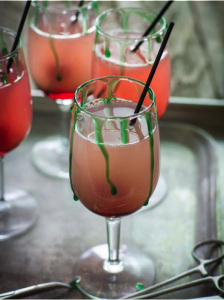 3) Insert stirrers through maraschino cherries for each drink and set aside. 5) Combine tequila, triple sec and lime juice in a cocktail shaker with ice and shake until very cold. 6) Pour one teaspoon of the maraschino cherry syrup into the bottom of each glass. Add a cherry and stirrer to each glass. 7) Pour the margarita mixture into each glass till about 3/4 full. 8) Top off each drink with 1/4 cup club soda and serve!